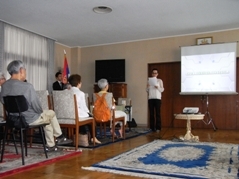 For the third time in last four years, "Nikko Travel Agency" (http://www.nikkotravel.co.jp/), with our support, promoted its new tour package to Serbia and region in the premises of the Embassy. 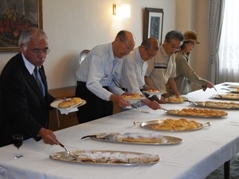 Japanese guests were warmly greeted by the Agency and Embassy representatives (Cultural Affairs Officer, Ms. Kovač). The program also included video presentation of Serbian nature beauties and traditional food and wine tasting. On invitation by Japan Academy, H.E. Mr. Mrkic and his wife attended the official ceremony in Tokyo to celebrate the 100th year of annual Japan Academy Prize, awarded to distinguished persons in the area of science and technology. His Imperial Majesty the Emperor Akihito of Japan and Japan's Minister of Education, Culture, Sports, Science and Technology (MEXT), Mr. Tatsuo Kawabata, addressed the members of the Academy, Government, diplomatic corps and other guests. 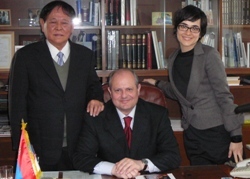 Two members of Japan Academy are members of Serbian Academy of Arts and Sciences and Serbian Academy of Engineering Sciences. We would like to send our warmest greetings to everyone who joined us at "Deja Vu Bar & Cafe" in Nishiazabu! It was a friendly and lively event, initiated by Mr. Živanović and supported by our Embassy and other companies, which attracted more than 200 people to support Serbian national team in match against Germany, and to enjoy Serbian cuisine. We hope everyone had great time and hope to see everyone at the next occasion. For more details, please check: www.serbia.jp. 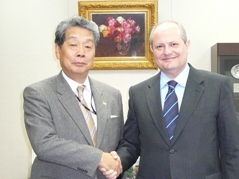 On June 15, 2010 Ambassador of Serbia H. E. Mr. Ivan Mrkic had a meeting with Honorable Mr. Muneo Suzuki, Chairman of the Standing Committee on Foreign Affairs of the House of Representatives. 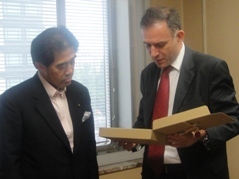 Mr. Masataka Ota, member of the City Parliament of Yokohama, who recently visited Serbia, was also present. In a friendly discussion that took place in the Chairman’s office in the National Diet of Japan, views have been exchanged on the priorities in the overall cooperation between Serbia and Japan, possible ways of their realization and numerous potentials for further improvement of our long-lasting bilateral relations. As a part of Embassy's efforts to strengthen academic ties and cooperation in the field of science and technology between Serbia and Japan, we had a great opportunity to host a meeting with member of Japan Academy and Serbian Academy of Engineering Sciences, Prof. Junichi Nishizawa. Prof. Nishizawa, one of the leading Japanese experts in the field of Electronics and Communication, expressed his willingness and offered kind support and his vast expertise in order to enable further expansion of bilateral cooperation. 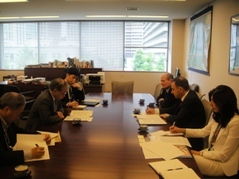 Regular political consultations between the Ministries of Foreign Affairs of the Republic of Serbia and Japan took place on June 8, 2010 in Tokyo. Mr. Zdravko Ponos, Assistant Foreign Minister, who headed the delegation from Serbia, exchanged views about all aspects of bilateral relations and multilateral cooperation with his Japanese host, Mr. Yasuaki Tanizaki, Director General of the European Affairs Bureau. Serbian delegation was also received by the Deputy Foreign Minister, Mr. Keinichiro Sasae. 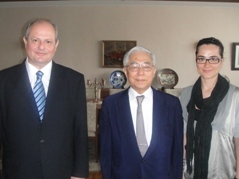 During their stay in Japan, Mr. Ponos and Mrs. Bojana Adamovic Dragovic, Head of the Asia, Australia and Pacific Department of the Ministry of Foreign Affairs of Serbia, had a meeting with Honorable Mr. Ichiro Aisawa, Chairman of the Japan – Serbia Parliamentary League of Friendship. They visited the Honorary Consulate General of the Republic of Serbia in Osaka and had a meeting with the Honorary Consul General, Mr. Naohide Ueyama. Friendly gathering and cheering for Serbia at the FIFA World Cup 2010 in Tokyo - INVITATION! 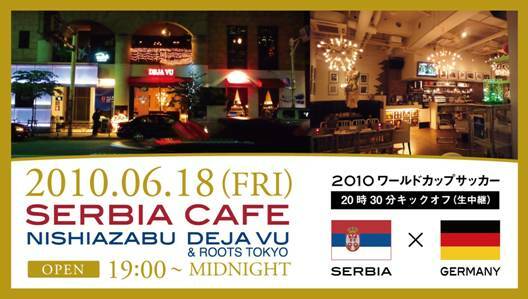 On the occasion of Serbian participation at this year FIFA World Cup in South Africa, all interested supporters and football fans are invited to join us at the Serbian Cafe Night on June 18 (Friday) in Tokyo, during Serbia vs. Germany match. This will be an opportunity to taste some Serbian traditional cuisine as well! This event was initiated by Mr. Sasa Zivanovic, who started the project for promotion of Serbia, its cultural heritage and tourist attractions during the World Cup, and in cooperation with the company "Les Mains" and our Embassy. 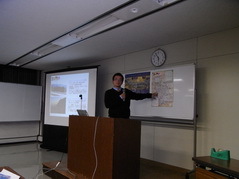 One of the project’s steps was creating the web site about Serbia in Japanese language: http://www.serbia.jp . Also, our distinguished coach and famous football player, Dragan Stojkovic Piksi, gave his valuable support for this interesting project, together with an interview, which could be read here: http://www.serbia.jp/01/ . High ranking delegation of Serbian Autonomous Province of Vojvodina visited Japan in order to promote business environment and investment opportunities for Japanese companies in this part of Serbia. Mr. Jovica Djukic, Provincial Secretary of Finance, Mr. Sinisa Lazic, Vice President of Vojvodina Assembly, Mr. Branislav Bugarski, Director of the Vojvodina Investment Promotion (VIP) and Ms. Sanda Emini, FDI Advisor in VIP were in the delegation. In a series of meetings with relevant Japanese ministries, institutions and companies, like METI, MOFA, JBIC, JETRO, JICA, Bank of Tokyo Mitsubishi UFJ, Mitsubishi Corporation, JTI, Isuzu Motors, etc. the delegation presented advantages of Vojvodina, as a promising investment destination. 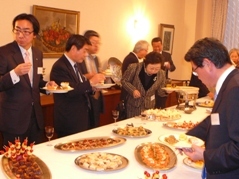 Vojvodina is already a host to more than 200 foreign companies’ investments, among them two from Japan. 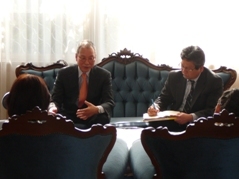 During the visit, a Memorandum of Understanding with the Japan Institute for Overseas Investment (JOI) was signed. During the meeting in the Office of H. E. Madame Keiko Chiba, Minister of Justice of Japan, Ambassador of Serbia H. E. Mr. Ivan Mrkic and Minister Chiba exchanged views and information on some important topics in our bilateral relations. They particularly agreed on significance of visa liberalization for Serbian citizens traveling to Japan and confirmed further steps in order to achieve it in the nearest future. Minister Chiba expressed her best wishes for friendly relations and overall cooperation between Serbia and Japan, along with her readiness to personally contribute to their further development. In the meeting with Ambassador of Serbia, H. E. Mr. Ivan Mrkic, Mr. Masataka Ota, esteemed member of the Parliament of the City of Yokohama, informed about his recent visit to Serbia, where he was received by the Deputy Prime Minister Mr. Bozidar Djelic and Mayor of the City of Belgrade Mr. Dragan Djilas. Mr. Ota conveyed his best impressions from the visit and his views regarding modalities of future cooperation between Yokohama and Serbian capital, Belgrade. Further activities, aimed at broadening cooperation to the benefit of both cities, have been agreed upon, including exchange of visits of their officials. Japanese theather troup "Black Tent" (http://www.ne.jp/asahi/kurotent/tokyo/ ) will introduce this year a famous play, "Paviljoni", by Serbian writer Milena Markovic, which was translated to Japanese language for this occasion. Performance will be directed by Mr. Djordje Marjanovic from Serbian National Theather in Belgrade. In the organization by percussion player Shinichi Uena i the group Phonix Reflection, and with the support of "Yamaha Co." and our Embassy, a concert "Souls of Percussion" will be held on May 21 with the introduction of five compositions by percussion player and composer from Serbia, Nebojsa Jovan Zivkovic. Once again, we had the pleasure of hosting a high school students' visits to our Embassy. We introduced to students from Miyagi and Hyogo Prefecture our Embassy's facilities and work, showed them Serbian national costumes and other handicrafts and talked about all aspects of Serbian history, tradition and culture, they were interested in. We really had a nice time together learning something new about Serbia. Aleksandar Kujucev, Serbian photographer and artist, was invited to show his work at the two exhibitions opened this month in Tokyo, organized by "Japan-Yugo Art Project" with the support of "Shiseido Co." and our Embassy. 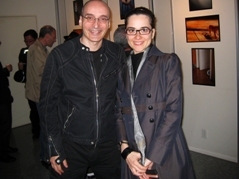 Kujucev was also one of the participants of the group exhibition "Serbian visual arts – Za sutra", held in Yokohama ZAIM in 2008. Head of Cultural Section, Ms. Kovac, was present at the opening in Zuisho Temple, where she addressed the guests and expressed her sincere gratitude for this promotion of Serbian contemporary art in Japan. - From May 14-25, „The Doubles - A Moment of Happiness II” at the „Den Gallery - Gendai Heights”(http://www.gendaiheights.fc2.com/index.html) od 13-22.00 casova. Mr. Toshio Maki, President of the International Friendship Association of Fujimi City, together with his colleagues from Fujimi City office, visited us regarding the upcoming visit of the representatives of Sabac City, their sister city, in October 2010. We conveyed our gratitude to Fujimi City for all the support and good will towards the citizens of Sabac and their continuous efforts in strenghtening of cultural and other relations with Serbia. Exchanging the views on the visit program and other technical details, we agreed to jointly work for its successful realisation. We had a great pleasure of hosting a dinner in the honor of Mr. Masataka Ota, Member of Yokohama City Assembly, and his family. This was also an occasion to extend Serbian hospitality and offer traditional cuisine to our guests, who were kind to previously welcome our Ambassador and his Deputy Mrs. Jankovic in Yokohama. Mr. Ota is due to visit Serbia in the second half of this month, together with Mr. Hiroyuki Okamoto, Chief Representative of Yokohama City in Frankfurt. 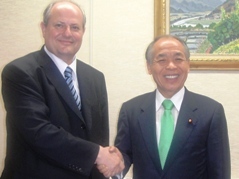 Ambassador of Serbia H. E. Mr. Ivan Mrkic received Mr. Masaru Imai, Associate Executive Director of the International Department of the Kyodo News Agency, accompanied by Mr. Kohei Maruyama, Chief Editor of the World Services Section in this Department. Citing excellent and fruitful cooperation between the Serbian Embassy in Japan and the Kyodo News over the years, they had a discussion about the recent reports released by Kyodo, regarding Serbian citizen who was seeking a kidney transplant operation in Japan. High representatives of Kyodo News expressed their sincere regret for the omission of the information which caused some misinterpretations of this humanitarian case, at the same time offering to help our citizen to acquire the operation and recover from this grave illness. We had a great honor to welcome the first Japanese member of Serbian Academy of Sciences and Arts, Prof. Tamio Yamakawa, with his colleague Prof. Kunihiko Suzuki at our Embassy. 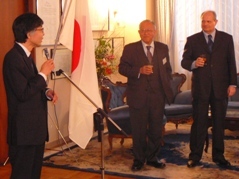 As a renowed expert in biochemistry, Prof. Yamakawa, a member of Japan Academy and Honorary Professor of Tokyo University, had an opportunity to establish and nurture relations with Serbian distinguished scientists, like academician Dusan Kanazir, for decades. He became the first member of Serbian Academy of Sciences and Arts from Japan in 1988. The meeting was an occasion to exchange opinions on the strenghtening scientific and academic ties between Serbia and Japan. Prof. Yamakawa and his colleague Prof. Suzuki, who is also a member of Japan Academy and a great expert in the field of neurochemistry with a vast experience in international cooperation, expressed their readiness to support our initatives and project aiming to enchance the bilateral scientific cooperation. 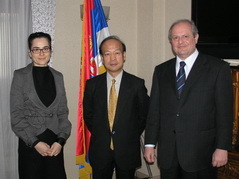 On the occasion of his appointment as a member of Serbian Academy of Sciences and Arts in November 2009, we invited Prof. Toshiaki Makabe, Vice President of Keio University, to discuss the further steps to be taken towards deepening of the scientific and university cooperation between our two countries. Prof. Makabe has long-term and fruitful connections with our experts in the Serbian Institute for Physics, Director Prof. Dragan Popovic and Prof. Zoran Petrovic. In our conversation, he expressed high opinion about scientific potentials in Serbia and proposed some framework through JSPS and other programs that would enable our young scientists to work on joint projects and acquire expert skills in Japan. As a high ranking Keio University representative, Prof. Makabe also welcomed the opportunities to build closer cooperation with the University of Belgrade. Ambassador of Serbia H. E. Mr. Ivan Mrkic and Honourable Mr. Satsuki Eda, President of the House of Counsellors of the National Diet of Japan, in the meeting which took place in Mr. Eda's official residence, exchanged views about bilateral cooperation between Serbia and Japan, especially between the parliaments of the two countries, and the possibilities for its future development. Serbian Ambassador also informed President Eda about recent activities of the Serbian National Assembly, including the adoption of the Declaration condemning the crime in Srebrenica, which occurred during the conflict in the former Yugoslavia in 1995. He explained that this was the first such document adopted among the countries that belonged to former Yugoslavia, with an aim to promote reconciliation and peaceful coexistence, expressing his expectation that other former Yugoslav republics too will follow Serbian example. Mr. Eda highly praised this act, expressing his hope for the lasting peace and prosperity of Serbia and the region of the Western Balkans as a whole. We had a great pleasure to meet with Prof. Yoshihiko Nakamura, one of the latest Japanese scientists to join the Serbian Academy of Engineering Sciences (in 2007), at our Embassy. His interest and research on humanoid robotics have brought him in closer touch with the achievements of Serbian academician Miomir Vukobratovic, the pioneer in this field and President of the Serbian Academy of Engineering Sciences. In our conversation on how to intensify scientific cooperation and exchange between Serbia and Japan, Prof. Nakamura conveyed his hopes that his respective Serbian scientists would join some of the projects at the Tokyo University and participate in programs such as JSPS. As a part of JICA Project aiming for the promotion of energy efficiency and conservation in Serbia, six-member Serbian delegation headed by Mr. Bojan Kovacic, Deputy Director of Serbian Energy Efficiency Agency (SEEA), came for two weeks' study visit to Japan. The representatives of Ministry of Mining and Energy, University of Belgrade and District Heating Company were also a part of this delegation, whose training program included numerous lectures from Japanese energy sector (TEPCO, METI) and visits to the power plants, facilities and factories around the country. 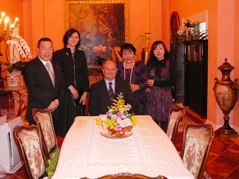 They also visited the Embassy, on April 13, and met with Ambassador and his associates. It was a great opportunity to hear about the ongoing JICA Project which will, in collaboration with SEEA and Serbian Energy Ministry, contribute to vast energy conservation in industrial sector, protection of the environment. Our delegation, together with the Embassy representatives, were invited to a dinner in Tokyo on April 13 hosted by TEPCO, which plays an important role in the Project. In his addressing, TEPCO Vice President Susumu Shirakawa commented about the fruitful cooperation between Japan and Serbia in the field of energy. Ambassador, thanking for their kind support, called for TEPCO investments in Serbia and invited Vice President Shirakawa to visit our country in the nearest future. 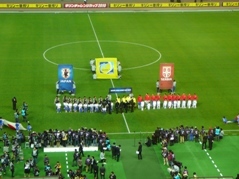 Friendly match between Serbian domestic league players and Japanese national team, called the Kirin Cup, was played in Nagai Stadium in Osaka, followed by Serbian winning with 3:0. Just two months from World Cup in South Africa, this game attracted a lot of media attention and filled the stadium with close to 50,000 viewers. Various dignitaries from royal family (HIH Princess Takamado), sport and football (Olympic Committee, football associations and professional leagues from both countries, national team coaches etc.) 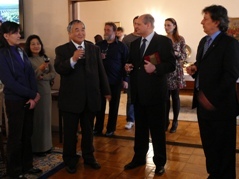 and Honorary Consul of Serbia Mr. Naohide Ueyama together with our Ambassador were present at the event. For this occasion, HIH Princess Takamado, as the honorary patron of JFA, along with Mr. Motoaki Inukai, President of JFA, Mr. Zoran Lakovic, Secretary General of SFA, Mr. Ryo Mayanagi, sponsor representative, and Ambassador Mrkic, were invited to take part in the Handshake Ceremony with players and coaches. This year, Mr. Rade Sandić, a representative from Ministry of Interior, is participating in the course on criminal investigation, organized by JICA and National Police Agency of Japan. The course, intended for developing countries, gathered participants mostly from Asian, African and South American countries, aiming to enchance the international police network and information exhange. Ms. Kovač, Head of Cultural and Press Section in the Embassy, met with our participant and the organizers at the opening ceremony, held in Tokyo on April 6. At the annual international contest, organized by "Ie-no-hikari" Association and UNESCO, with the support of various cultural and art institutions in Japan, three Serbian participants were awarded with the Bronze awards among more than 43.000 applicants from 67 countries and regions. Ms. Kovač, Head of Cultural and Press Section in the Embassy, was present at the award ceremony held in Tokyo. Our Embassy was also presented with the Letter of Appreciation for the cooperation on this occasion. In organization by Japanese Association of Tourism Agents (JATA) and with support of our Embassy, representatives from tourism offices in Japan had an opportunity to hear about the tourism potentials and beauties of Serbia, as well as the experiences of JATA Study Tour participants who visited our country last July and November. Following the address of Ms. Kovač, Head of Cultural and Press Section in the Embassy, Mr. Hisashi Yamazaki, tourist guide and associate of Tourism Organization of Serbia, held a presentation about popular attractions in Serbia and provided some newest statistics and other useful informations for attracting the interest of Japanese visitors. He stressed the possibilites of increasing the number of tours and tourists from Japan, given the support and activities by Serbian tourism authorities, country's capacities in this industry and potentials of the region as a whole. While on their Japan tour, the members of National Ensemble "Kolo", headed by Director Radojica Kuzmanović, and together with their organizers from "Folklore Report", payed a visit to our Embassy. 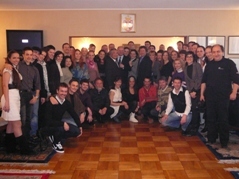 Embassy representatives, guests from Serbia and the tour organizers exchanged their impressions about numerous concerts and workshops on Serbian dance techniques held across this country. Ambassador Mrkic greeted the guests and thanked them for successfully promoting the name and culture of Serbia on such a wide scale in Japanese public and media. The coming of "Kolo", after more than 20 years, re-introduced the vibrant and attractive image of Serbian people and their customs to the people in Japan. Director of "Kolo" Mr. Kuzmanovic and Director of "Folklore Report" Mr. Matsunaga also expressed their warm gratitude for this gathering and the support of our Embassy. The orchestra of "Kolo" spiced the atmosphere with their performance of some Serbian national music, later joined with the rest of the "Kolo" Ensemble, who shared their powerful voices with us. Ambassador Mrkic, Director of "Kolo"
Serbian academic sculptor Mr. Goran Čpajak won one of the awards at the renowned "11th Kajima sculpture Competition", sponsored by Kajima Corporation in Tokyo. He was the only foreign artist selected among 240 entries for this biennial indoor competition, under the theme of "Sculpture, Arhitecture and Space". Mr. Čpajak has been exhibiting and competing in Japan before, and this award was a confirmation of his talent, vision and long experience. He attended the Award Ceremony and met with our Head of Cultural Affairs Ms. Kovač. his awarded piece "The Gate of Time"
MOFA of Japan hosted a "Simposium on the Promotion of Japanese Studies" in Tokyo aiming for further development of studies of Japanese language, culture and history in Central and South East European countries. Participants from the universities of Serbia, Bosnia, Bulgaria, Croatia, Greece, Romania, Slovak Republic and Slovenia were invited to present their views and experiences in this area and strengthen the networking not only with Japanese counterparts but also among their respective institutions in the region. Serbian speaker, Mr. Dalibor Kličković, Lecturer from Japanese language and literature Section at the Faculty of Philology of the University of Belgrade, elaborated on the history and present situation of Japanese studies in this oldest university level study in Serbia, its current challenges, projects and achieved improvements. The symposium was also attended by representatives of Japanese institutions (MOFA, Japan Foundation), universities (Tokyo University, Hokkaido University etc.) and respective Embassies of foreign attendants. Today the Board of the International Ladies' Benevolent Society (ILBS) held a meeting at the Embassy of Colombia. One of decisions taken by the Board concerned the activities of NGO "Actions for Children in Crisis", which is yet again scheduled to go to Serbia, Kosovo and organize workshops for assisting ethnic groups in need, especially children. Prof. Takamiyagi, Chairman of the Board of Directors at The Society for the Advancement of the Traditional Okinawan Karate, Hanshi 9 Dan, visited us in Tokyo and shared some news about cooperation between Serbia and Okinawa. He announced a plan to visit Serbia with his colleagues for the participation in cultural exhange event. We offered our support and expressed once again deepest gratitude for this valuable friendship with Serbian people and karate-do followers in Serbia, embodied in the continuous efforts and affection of Prof. Takamiyagi, Okinawa Karate-Do Association and their members. 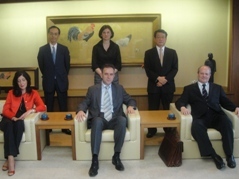 Ambassador of Serbia H. E. Mr. Ivan Mrkic, accompanied by the First Counselor Mrs. Snezana Jankovic, visited the City of Yokohama, on March 1, 2010. During the meeting with the Mayor of Yokohama, Ms. Fumiko Hayashi, an exchange of views took place regarding the possibilities for future cooperation between Belgrade, capital of Serbia, and Yokohama. It has been mutually concluded that vast possibilities for cooperation should be materialized through concrete initiatives. Ambassador Mrkic also met with the Director of the local Kanagawa TV station, Mr. Kuniyasu Komiya, and discussed some schemes for presenting Serbia, its culture, tradition and economic potentials, to the viewers of this television. During the visit to Yokohama, special and warm hospitality was extended to the Embassy representatives by Mr. Masataka Ota, prominent veteran member of the Yokohama Parliament, who plans to officially visit Belgrade in the near future. 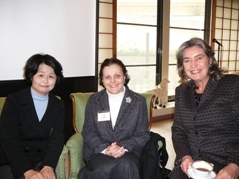 The cooperation between Serbia and Yokohama especially gained in dynamics after our Embassy’s participation in the Yokohama Harvest Fair in October 2009, which was made possible by valuable support and effort of our friends in the business community of Yokohama. 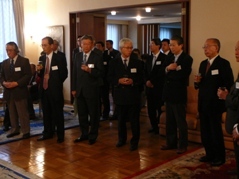 Japan - Serbia Exchange Association held its Annual assembly and reception in our Embassy. After the plenary meeting for the members, President of the Association, H.E. Dr. Takehiro Togo, President of the Board, a Board Member, and H.E. Mr. Ivan Mrkić, greeted the guests. Both have expressed their wish to continue and expand fruitful cooperation and exchange between Serbia and Japan, which was highlighted last year with visits of Deputy Prime Minister of Serbia B. Djelic and Minister of Foreign Affairs V. Jeremic. After the toast by Board Director and Tokyo University Professor, Nobuhiro Shiba, guests had the opportunity to enjoy some Serbian traditional food and spirits. Ambassador Mrkic met with Prof. Ikuo Kameyama, President of Tokyo University of Foreign Studies and renowed scholar on Russian literature to discuss about further strenghtening the long cooperation between the Tokyo University of Foreign Studies with Belgrade University. This visit was a great opportunity to exchange views on the possibilites to increase the number of exchange students and teachers, about the development of Serbian language studies (courses wil start this April) and future research projects, that will focus on Serbia and Balkan region. 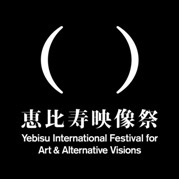 Among dozen international leading and emerging visual artists presented at the second Ebisu International Festival for Arts & Alternative Visions in Tokyo Museum, Serbian artist Katarina Zdjelar was invited to show her video art. It is the first time for Serbian representative to take part in this festival. Four works by Zdjelar, which represented Serbian at the 53. Venice Biennale in 2009, were chosen within the Festival theme "Searching Songs". 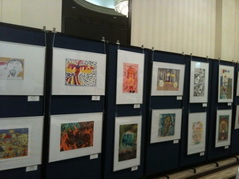 Embassy's representative Ms. Kovac attended the opening of the exhibition. Serbian Statehood Day "Sretenje" was marked this year in Japanese daily newspapers "The Japan Times" and "The Daily Yomiuri", which you can see here. Long awaited, the famous and oldest Serbian dance ensemble started their tour around more than 20 Japanese cities. After more than 20 years since their last performance in Japan, 45 dancers and musicians of "Kolo" will introduce the most famous dances and songs from Serbia, well known for their vibrant and colorful character. The audience will also have the opportunity to find out more about our culture, customs and national costumes. Marking this important moment, on February 11th they held a special concert for guests of the Embassy and general public in the Arts Building of National Olympics Memorial Youth Center in Tokyo. Ambassador Mrkic greeted the audence and expressed his sincere appreciation for all the efforts by the organizer Mr. Masunaga from "Folklor Report" and "Kolo" director Radojica Kuzmanovic. Apart from the concerts, members of "Kolo" will also hold seminars on Serbian national dance. For more information on the tour dates, seminar applications and ticket purchase, please visit: http://www.folklor.com/. Ambassador addresses the audience in Tokyo Serbian dance by "Kolo"
Serbian dance by "Kolo" Serbian wedding dance by "Kolo"
Ambassador Mrkic made a curtesy call to Vice Governor of Hokkaido Kunihiko Yamamoto. Warmly greeted in the Office of the Governor in Sapporo, Ambassador informed about the previous visit to Hokkaido University and proposed some frameworks for establishing long-lasting and friendly relations between Serbian and Hokkaido cities and people. Japanese side expressed their readiness to push things forward. Third Secretary A. Kovac from the Embassy and Director of International Affairs Tetsuo Sato from Office of the Governor were also present. 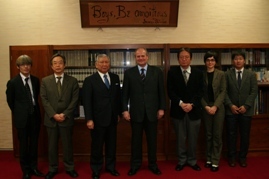 During his first visit to Hokkaido, Ambassador Mrkic, accompanied by Third Secretary A.Kovac, met with the President Hiroshi Saeki, Vice President Takeo Hondo, Director for International Affairs Akihiko Noda and representatives of Slavic Research Center. They had fruitful talks aiming for increasing the number of students from Serbia in Hokkaido University, expanding opportunities for Japanese students to learn Serbian language and formalizing the cooperation with the Belgrade University. 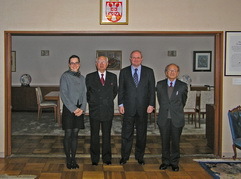 Director of Slavic Research Center Akihiro Iwashita also invited Ambassador and Ms. Kovac to his institute. Prof. Tetsuo Mochizuki and Associate Prof. Motoki Nomachi were kind to join and talk more about their activities in the Center and upcoming projects. They gave us a tour around SRC, which hosted some Serbian researchers in the past. Serbia Cultural Exchange Association (www.japan-serbia.org), supported by the Embassy of Serbia in Japan and the company "Adria International Co. Ltd.", hosted the Serbian Charity Fair in Tokyo (January 23 - February 7). On January 31, Serbian Night was organized for the second time, aiming to bring closer Japanese and Serbian community in a friendly and hospitable atmosphere. Red wine from Serbian wine cellar Jelic (http://www.tamuzvino.com/) was presented at the specially organized dinner "Premium Wine Night" in Tokyo hosted by "AI Corp.". The number of Serbian wine's admirers in Japan is steadily increasing and the wine quality was shown again in 2008. when Jelic Cellar owner won the prestigious award at the "Japan Wine Challenge" in 2008, for its 2006 red "Millennium Barrique". Ambassador Mrkic and his wife have been honoured and delighted by the invitation of their Majesties, Emperor Akihito and Empress Michiko, to a lunch at the Imperial Palace. The oportunity of listening to Their Majesties and exchanging the opinions with them were an unforgetable experience. It was the occasion to recall the long standing relationship between two countries, established by the official correspondence between Serbian King Milan Obrenovic and Japanese Emperor Meiji in 1882. 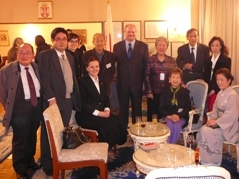 On January 9, 2010 a symposium was held on the history, literature and regional cooperation in the Eastern Europe, covering various aspects of the academic studies of this area. Recent history of Serbia and the issue of its southern province of Kosovo and Metohija was also one of the topics. The Symposium was dedicated to Prof. Nobuhiro Shiba, renowned scholar and one of the founders of the Eastern Europe studies, who is about to retire from the University of Tokyo in March this year. Among the panelists were university professors, many of them Slavists and experts in the Balkan and Eastern Europe region, postgraduate students, representatives of NGOs and others. The Symposium has provided a comprehensive picture of the state of affairs in the region, as well as about the high level of the related studies in Japan. Organized by the municipal office of Shinagawa, with the support by local international friendship associations and surrounding embassies and consulates, including Serbian Embassy, International Exchange Exhibition opened in the Shinagawa Library, featuring the their foreign cultures.